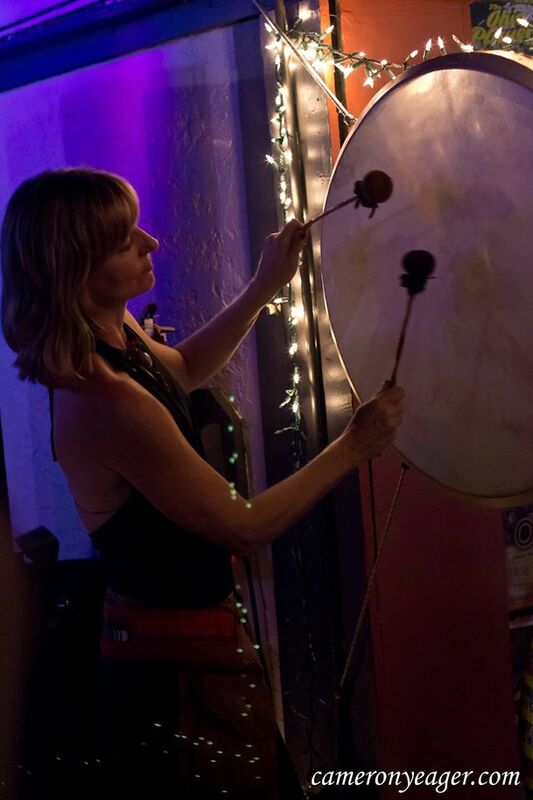 Cancer Survivorship Benefit for Sheila Shine & SPIRITS RISING at New Mountain on Friday 8/14 w/ Drumming, Music, Great Food and Drink, Dancing and more! 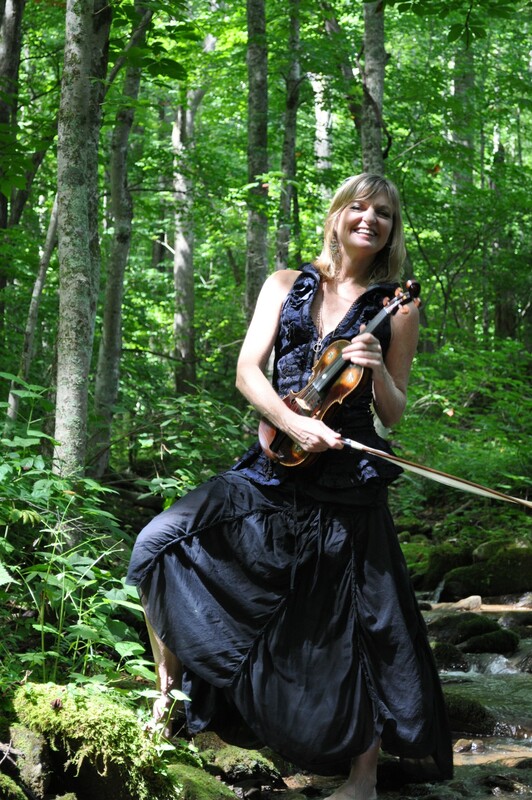 ASHEVILLE, NC — New Mountain in Asheville has generously offered their space to host multiple benefits for Sheila McGuire, or Sheila Shine as most know her. The 2nd of which is set for Friday, August 14th at New Mountain. Performers for the evening include progressive folk-grassers Fireside Collective, the international country music sounds ranging from West Afrique to Western North Carolina by Les Amis (feat. Justin Perkins and Drew Heller from Toubab Krewe, Adama Dembele and Ryan Reardon from Zansa and Kevin “KalimbaMan” Spears), and an acoustic/electronic mix of funk, afro-beat, latin, trance with a dash of rock from KalimbaMan. Barbie Angell. Photo by Cameron Yeager. Doors open at 6:30pm with an Interactive Family Drum Circle with DRUMSTRONG starting at 7pm (outside if weather permits). Bring your drum for an opening ceremony to drum in honor of, or in memory of, for your own fortification or just out of the goodness of your heart. 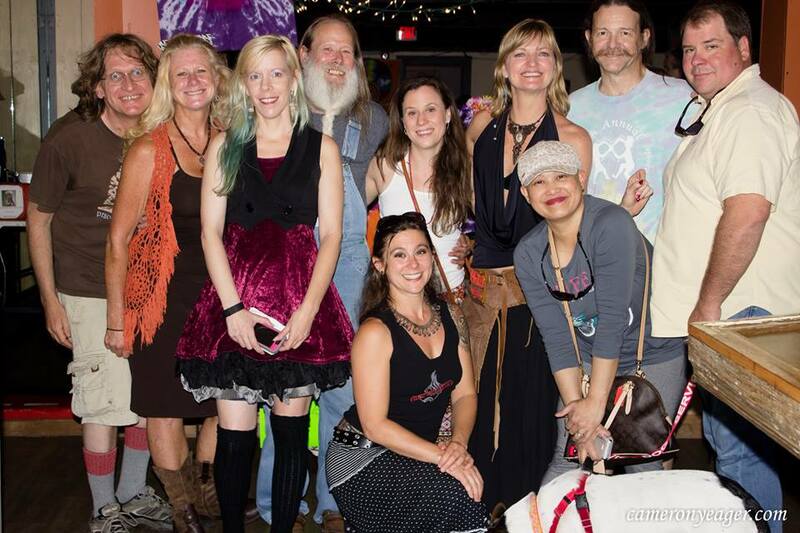 There will also be a silent auction and raffle including an ongoing raffle to win two VIP tickets to String Cheese Incident’s Suwannee Hulaween in Live Oak, Fl over Halloween weekend (a Hulaween winner will be draw at the next event, taking place on September 24th). New Mountain is also donating tickets to raffle off on the 14th to a handful of upcoming shows including Hard Working Americans (8/21), Yo Mama’s Big Fat Booty Band w/ Jonathan Scales Fourchestra (8/27), Ben Lovett’s Time Machine Dance Party (8/28), and Karl Denson’s Tiny Universe+Earphunk (9/19). Also up for raffle are two month-long yoga passes to Veda Studios. There is a $10 suggested donation for benefit (which includes a raffle ticket). 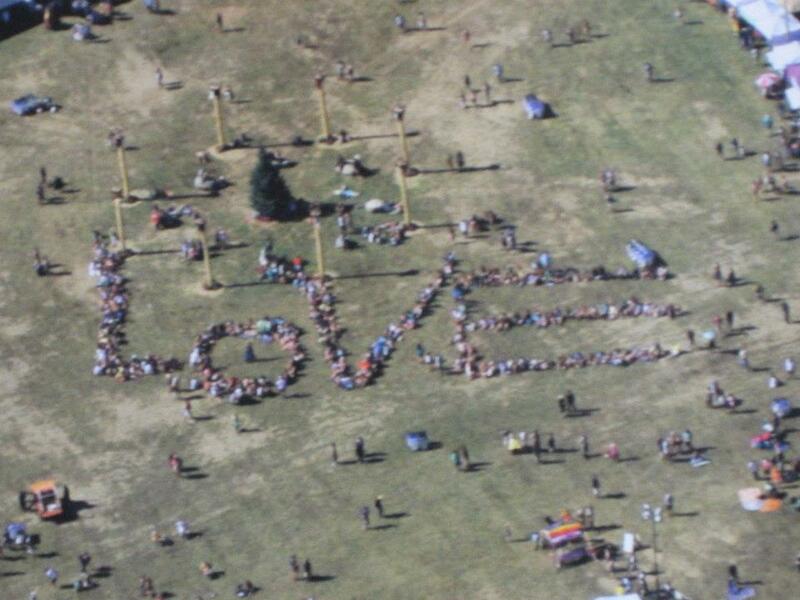 Please stay tuned for details on future “Shine On” events. Sheila Shine at New Mountain. Photo by Cameron Yeager. Last year, Sheila was diagnosed with breast cancer. Since August 19, 2014, she has endured five cancer surgeries including a double mastectomy, along with dealing with chronic back pain from an injury she sustained when hit by a drunk driver in 2005. Her final surgery blessedly came back with positive results of being cancer free as of June 19th, 2015. Although she is now receiving Medicaid, the financial burden of having not been able to work, coupled with other health care and living costs, has put her livelihood in jeopardy. In the midst of her health crisis, Sheila has also been fighting to keep her beloved mountain sanctuary home Spirits Rising, in Little Pine Valley of Marshall where she has lived since 2007, which is facing foreclosure. It is difficult enough to endure a trauma to one’s physical body, let alone have trauma in their sense of security and place of refuge. 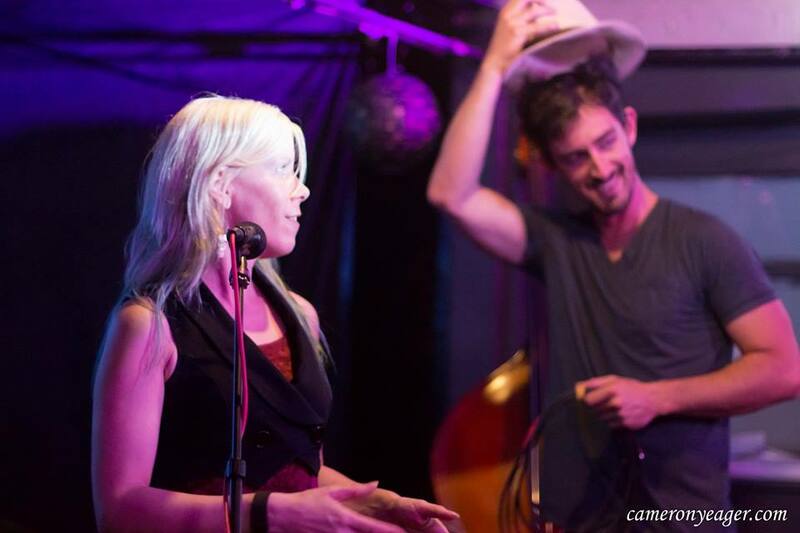 With the support of a wide network of friends and festival family, Sheila has been able to open up and talk about her experience with others and is working toward manifesting her dream of making her home a mountain retreat for musicians and others with cancer to recuperate. Now let’s help her get back on her feet financially and celebrate life while doing so. The Sheila Shine Foundation will blossom by your participating in committing to share your pulse and making tax deductible donations through DrumsForCures’ 501(c)3 non-profit organization. Donate via PayPal at scott@drumstrong.org and make sure to note the donation is in honor of in honor of Sheila Shine on the email. This charitable Contribution to DrumStrong will give money to Spirits Rising directly with 10% going to DrumsForCures, as will funds raised at each event. Music, Poetry, Hula Hoops & more! 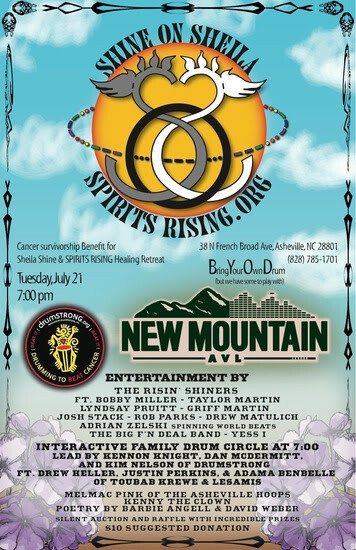 New Mountain in Asheville has generously offered their space to host multiple benefits, in which Sheila is actively participating in, throughout the coming months with the first being held on Tuesday, July 21st in the outdoor courtyard. Performers set for the evening include The Risin’ Shiners (ft. Bobby Miller, Taylor Martin, Drew Matulich, Josh Stack, Rob Parks, Griff Martin, and Lyndsay Pruett), Selector Az-iZ (Adrian Zelski of DubConscious), The Big F’N Deal Band, Yess I, Melmac Pink of Asheville Hoops, Kenny the Clown, poetry by Barbie Angell and David Weber. 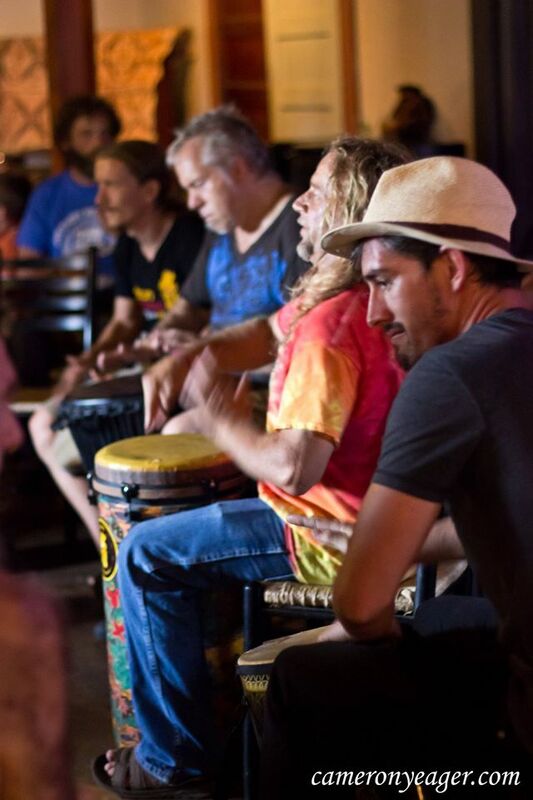 Doors open at 6:30pm with an Interactive Family Drum Circle with DRUMSTRONG starting at 7pm. Led by Kennon Knight; Dan McDermitt, and Kim Nelson of DRUMSTRONG; Drew Heller & Justin Perkins of Toubab Krewe & of Les Amis; Adama Dembele of Zansa & Les Amis & others! Bring your drum for an opening ceremony to drum in honor of, or in memory of, for your own fortification or just out of the goodness of your heart. There will also be a silent auction/ raffle and educational materials on site including information from Mission Hospital’s Ladies Night Out program. $10 suggested donation for the event (Includes a raffle ticket). For each benefit, we are seeking donated items such as artwork, music/ art lessons, gift certificates to local businesses & restaurants, and other creative ideas. We are also in the planning phases for the events further out; if you would like to perform, contribute, or have any other creative ideas, please do let us know. There are benefits planned each month up through the end of the year; please stay tuned for details. Sheila has been a good warrior and has been fighting for life. Since August 19, 2014, she has endured five cancer surgeries including a double mastectomy, along with dealing with chronic back pain from an injury she sustained when hit by a drunk driver in 2005. Her final surgery blessedly came back with positive results of being cancer free as of June 19th, 2015. She still has to be careful, especially with her nutritional needs and stress levels. She’s out of the woods and feeling much better, but she still has a long road paved with more surgeries and medication regimens ahead of her. The Sheila Shine Fund will blossom by your participating in committing to share your pulse and making tax deductible donations through DrumsForCures’ 501(c)3 non-profit organization. Donate via PayPal at scott@drumstrong.org and make sure to note the donation is in honor of in honor of Sheila Shine on the email. This charitable Contribution to DrumStrong will give money to Spirits Rising directly with 10% going to DrumsForCures.